Historians (mostly liberal) have consistently rated Woodrow Wilson among our best presidents. Wilson was progressive in domestic policy (except on the issues of race and wartime political dissent). His foreign policy combined interventionism with utopianism. Thomas Woodrow Wilson was a son of the South. He was born in 1856 in Staunton, Virginia, and spent his teenage years in Columbia, South Carolina. Columbia was the cradle of the Confederacy and Virginia the home of the Confederate capital, Richmond. Before entering politics, Wilson’s world was academia. O’Toole spends only a single chapter on Wilson’s successful academic career. He taught at Bryn Mawr and Princeton. He wrote influential academic books, especially Congressional Government (1895) in which he urged the United States to turn to a Parliamentary system linking the executive and legislative branches of government. Such a government, he believed, would be more effective without the checks and balances institutionalized by the Founding Fathers. In 1902, Wilson was named President of Princeton, but he had a longing for politics and power. He was elected Governor of New Jersey in 2010, and two years later won the presidency when Theodore Roosevelt, running on the Progressive Party ticket, split the Republican vote with incumbent William Howard Taft. Wilson began his presidency in 1913 poised to implement a progressive agenda and to stay out of the storm gathering in Europe. His Secretary of State, William Jennings Bryan, was a committed pacifist. Wilson as an academic was fascinated by the process of politics and constitutionalism, but had little intellectual grounding and no experience in foreign affairs. Hard-headed geopolitics would never play a part in Wilson’s worldview. It was German atrocities, unrestricted submarine warfare, and the diplomatic blunder of the Zimmerman Telegram that forced Wilson to ask Congress to declare war on Germany in 1917. The war, Wilson said, was to be waged to make the world safe for democracy. The United States had no selfish interests, he claimed, and the peace following the war must not rest on a balance of power but on the ideals espoused by Woodrow Wilson. Wilson waged war in his second term as righteously as he avoided war in his first. Wilson never seemed to appreciate that it was far easier to espouse ideals when your nearest potential enemies were an ocean away. France and Great Britain did not have that luxury. In foreign affairs, Wilson had no sense of history and no understanding of what the British geographer Halford Mackinder called geopolitical realities. “Lost in dreams of peace,” O’Toole writes, “Wilson had allowed himself to be transported from the world as it is to the world as he thought it should be.” This is the essence of utopianism. Moreover, once Wilson committed the nation to war he brooked no opposition, either from his advisors, members of Congress, or from American citizens. The Wilson administration, O’Toole notes, “carried out an unprecedented assault on the civil liberties of those who opposed the war.” American citizens who spoke out against the war and conscription were prosecuted and imprisoned by Wilson’s Justice Department. Newspapers that opposed Wilson’s war policies were effectively censored by denying them the use of the mails. There were sound geopolitical reasons for the United States to enter the war on the side of Britain and France. America’s security has always depended on the Eurasian balance of power. But Woodrow Wilson did not think in those terms. And when he tried to dictate the terms of the armistice after the war, neither the European powers nor his opponents in the U.S. Senate acceded to his demands. This brought out the worst in Wilson; what Paul Johnson called his “self-regarding arrogance and smugness, masquerading as righteousness.” Wilson compromised with the allies abroad, but refused to compromise with GOP Senators at home. Instead, he barnstormed the country in a futile attempt to win Senate ratification of the Versailles Treaty and his cherished League of Nations, and suffered a series of strokes from which he never fully recovered. 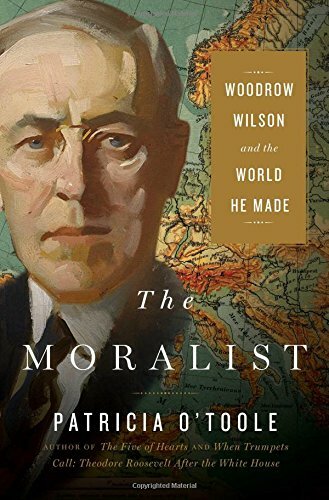 “Wilson assumed,” O’Toole writes, “that longings for the democracy, liberty, and justice won in the American Revolution were universal and that Americans had a mission to share them with the rest of the world.” Although Wilson failed to remake the world in America’s image, his worldview—Wilsonian idealism—took root and for better or worse (mostly worse) has influenced U.S. foreign policy and policymakers to this day. O’Toole clearly admires Wilson’s idealism and contrasts it favorably to the nationalism of Warren Harding, Calvin Coolidge, and Donald Trump, and the realism of Richard Nixon. Statesmen, however, should be judged not by the purity of their ideals and intentions, but by the consequences of their actions and policies.